We love preserving family memories, but to date we’ve overlooked a furry fixture of many people’s families and childhoods: a beloved pet. Well, pets need to be remembered, too! So this weekend at ScanCafe, we are celebrating the upcoming Pet Owners Day by asking folks to share a memory of a pet who was special to you in the past. Just go ahead and share your memory with us in the comments below. Or, if you would like to share a picture as well, you can post it on our Facebook fan page. When my brother and I left for college, my parents–who told us for the length of our childhoods that we couldn’t have a dog in the house, due to unspecified “allergies”–promptly went down to the pound and…got a dog. You would think we’d have been a little nonplussed. But he was fantastic–a feisty black terrrier–and he liked nothing better than to play tag across the whole house at breakneck speed, which was pretty funny since he had no traction, on account of the hardwood floors. He slipped and slid like that for about 12 years, I think, and it was painful to see him slow down in his old age, and more painful still to see him finally go. We have just one good photo of him, too. Mac, we hardly knew you. The first being who gave me unconditional love was my first cat. I returned that love, forty years later I realize how important that relationship was to me and how much it helped me stay in one piece. Spike and were sad when I got married and took him with me. Spike was like our first baby, and we enjoyed him right through my pregnancy with my son…unfortunately he did not life to see my son being born. Today I still suffer from dog allergies, and still have a dog…and always will. Thank godness we decided to defy my folks and get a dog or I would not have known the joy of having them in my life! Growing up we had a variety of pets, one dog and the rest were cats. Toward the end of my high school career we were animal-less and I saw a stray black cat on our back porch and my dad (who hates, but tolerates, cats) opened the back porch to yell at it to leave. I took pity on the cat because it was the middle of winter and freezing out and very snowy so I went out to get it. It was sad and limping as if it was hurt. When we took it to the vet we found out it was pregnant with a litter of cats and also that someone had shot her with a BB gun and she had a broken pelvis. Poor little cat. In the spring she gave birth to a littler of kittens and we gave most of them away but kept a couple. That was 13 years ago and my parents have had one of the cats the entire time. For an outdoor cat that’s a long time. Unfortunately for my dad my mom vowed that it was the last cat they would have and the cat lived the longest life any of our outdoor cats have ever had. When our cat Sadie was about 6 months old, my wife and I decided to try to train her to use the toilet. Part of the training involved putting treats on the closed toilet seat so she would get used to being up there. One day while my wife was getting ready for the day, little Sadie thought it was time to get treat on top of the toilet. She didn’t know, however, that the toilet seat was down, and Sadie jumped right into the toilet water. She was so upset and frightened that she was afraid to go near the toilet for a long time, and the toilet training was put on indefinite hold. We had a chihuahua during most of my childhood, into early adulthood. She was really my mother’s dog, preferring to sit on my mom’s lap most of the time. However, whenever I was sick or sad, she would curl up on my legs and be comforting company. One of my favorite pictures is of me holding her while sitting in a car, although she usually hated getting into the car for any reason. Most of the time, she would hyperventilate in the car. Poor little thing. I’ve only had one pet growing up and his name was Rogi. He was with my family for nearly 17 years and in the end, a twist of fate had me being the one to be with him when advanced cancer required that he be put down. Holding him as the veteranarian euthanized him was beyond painful and all these years later, I can still close my eyes and see his face in those last few moments. Timmy was a foundling whose mother and siblings had apparently been swept up by the local animal control. He was so young that we had to bottle-feed him for the first few weeks. During his “teen-age” period he seemingly had a problem with shoe laces. He absolutely destroyed them. Even though this attack on shoe laces was short-lived, to this day I tuck my shoe laces inside my shoes to keep them safe. 🙂 He was a very sweet companion and lived to be 13. We lost him a little more than a month ago and I still look for him to greet me when I come home. I miss him a lot! Shortly after the circus left my hometown, my mom and I went to the pound and I got my first dog. He was a shaggy, mid-sized mutt that I named ‘Ruff’. He seemed to be especially well trained and could naturally do all kinds of tricks like jumping thru hula-hoops. I loved him very much and he was great entertainment for my family and friends. Unfortunately, after a few months he got out of our yard and was hit and killed by a car — I cried for weeks. A few months later when the circus came back to town my mom and I went to see the show. They had trained dogs for part of the show and during the performance the trainer mentioned that she had lost one of her dogs here in my home town the year before. I knew then where Ruff had come from, and also knew that he was probably still ‘wandering’ somewhere in heaven! My cat’s name was Fonzie, (yes… his namesake was Arthur Fonzarelli). I remember my grandmother hated that name and when she came to visit she always called my cat Creampuff instead. I was Fonzie’s favorite person in the world so that information alone proved he was extremely wise. I remember our family was moving to a different house and we kept taking our belongings in trucks for a few day in a row. Fonzie went up into the rafters of an old shed and refused to come down. Everyone tried to persuade the cat to come down, but only my arrival and voice did the trick. Talk about feeling special 🙂 One of many stories, I loved that cat. Tippy was a stray that showed up in my grandmothers yard, she quickly discovered Tippy could walk on it’s front paws and do standing backflips among other tricks. Tippy used to ride around on my grandmother with her front paws on her head and back paws on her shoulders. That dog kept my Grandmother company for many many years and was as old and rickety – and grumpy as my aging aching Grandmother became. It was true love. My first dog was a rescued pointer dog named Saffo. My husband wad so excited to have a real hunting dog. However, every time he took out his rifle, Saffo got under the bed!! I was eight years old in 1970 when our family got a kitten named Pyewacket. He was supposed to be a family cat, but he quickly chose me as his human. He could sense when we were going to our cottage. He hated the long ride in the car, and would start hiding out days before we even got the suitcases out. Once we even had to postpone going for a day because we couldn’t find him. He truly knew what being a cat was about. I grew up with a wonderful dog named Susie. She was such a lady that she would always cross her legs when she sat down and tolerated all my young boy wrestling antics and always greeted me when I came home with wonderful tail wagging. I was indeed blessed. Simmy was a stray that the animal shelter found in back of an abandoned apartment complex. She was in a cardboard box with her litter mate. I took her years to warm up to anyone new, but she filled our lives with love and laughter, especially when she pulled the squirles off the tree while they were running up the trunk. No one will ever be able to replace her unconditional love. Marmaduke was my first dog. He was a Golden Retriever and Great Dane mix. I was just a lil’ guy and he was a BIG dog. I can remember riding on his back like a horse. Patches was our first pet, a lovable little black & white dog that my sisters and I played with for hours. Will post a picture of him so you all can see. I convinced my parents to buy Twix when I was 9. I spent Christmas going around to my brothers and sisters to collect the $100 for the deposit and then giving it to my parents. The best part about Twix was that she would only listen to me. Those were the good old days. I’m just waiting to get in a big enough place to get another chocolate lab like Twix. Twenty years ago my daughter moved to a new job in a city where she could not care for her year old puppy. Bianca flew 2000 miles to my home where she filled my empty nest with companionship and joy for 11 years. When I was young, my father picked up an abandoned white cat from the library where he worked. The cat was white all over, except for a prominent black spot on the top of it’s head. Although it was annoyed at being put in a box for the ride home, it quickly made itself a part of our family. I think he lived for about 10 years, but we called him ‘white cat’. We used to come home every day to find that our dog Lani had made her way past the wooden fence that circled our house. We could never figure out how. Then one day, as we pulled our car up to the top of our long driveway, we saw Lani jump onto the top of the gate which was probably about 4 feet high! We think she saw our cat doing it, and just copied her. 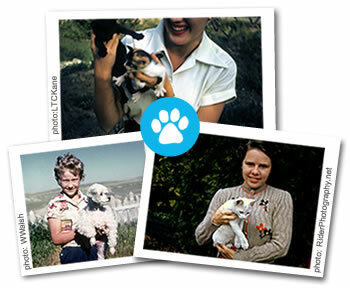 Was so glad when I found the box of slides that had a picture of my first dog, Floppy. While growing up in South Africa, we had a fox terrier, named Penny. He had the special skill of killing snakes, mainly cobras. He would dance around a snake, barking, with the snake pitched up and turning to keep up with him. When the snake struck, Penny would be fast enough to duck out of the way, and then grabbed the snake behind its neck, shake a few times and let go. The dance started all over with another strike and behind the neck shake until the snake got so tired and injured that the last shake delivered the death bite. We eventually gave the dog to a farmer who kept him for several years until his death — of a snake bite. I will never forget the day my wife and I brought “Oscar” home. He was our first “little” dog, replacing a long line of loyal Rottweilers we raised as family members who guarded our two daughters as they grew up from babies into adults and left home to find their own way. Oscar is a miniature Daschund, a double-dappled, Piebald, Blue-eyed ball of energy who brought laughter back into our lives following painful, frustrating, demoralizing and debilitating injuries which reduced our ability to physically get around and mentally challenged our will to go on in life. Always willing to join us in a free for all tussle, a slow walk, a nap in our lap, or just wandering around the house to check up on us when he loses sight of where we are, he has been a great companion for almost four years now. We had once vowed to “never get a lap dog”, but that viewpoint has long since changed. We have been won over by his love and loyalty to us,… now if we could just get him to bark a bit less at things that go “bump in the night”, all would be well. Rags was like a big dust bunny. A very cute, toothless dog. How could you not love him! We had a “greyt” adopted greyhound named Molly. She was 8 when we adopted her. After retiring from the racing circuit at age 4, she was adopted out to a family. That family abandoned her 4 years later, and she was picked up wandering the streets by animal control and giving back the the greyhound adoption agency. She was a fantastic dog with loads of personality. She would “talk” when excited and when she wanted to express herself. She didn’t run often, but when she did, she was amazing fast! Much faster than our other greyhound who was younger by over 5 years. Molly was my special Corgi. When I was on bedrest during my first pregnancy, Molly would keep me company and keep me from worrying about all the things that could go wrong. When my son was born healthy, Molly became his best friend for 12 years until she passed away at the age of 14. I adopted a huge dog named Chester when I was a kid. We had a fish pond in the backyard full of goldfish. In the heat of the summer, Chester would get into the pond displacing all of the water while eating the fish that would get pushed out of the pond by his huge body. Then Chester would smell like a dead fish and would jump on us all. Good times. Coco was a shelter dog we adopted. He was so timid when we got him. Over time he turned into a real ganster and had the run of the house! My first pet was a beagle pup named Chips. I was probably a year old when we had Chips. Obviously, I don’t remember him, but I love looking at old photos of Chips and I. Second pet was another beagle…this one named Max. I was older then…around 4 years old. He was such a cute little pup. We’ve got some great photos of him, too! For almost 20 years, we had a wonderful blue point Siamese cat named Chid Chon (a Siamese name). He was fiercely independent and despite being de-clawed, awed all dogs and wildlife in the neighborhood. He came in for the night when I called him, and I loved having him curl up in my room while I read. Stella was our first dog. She was a rescue dog and mix between a beagle, a lab and a cocker spaniel. She loved long trail runs She was always afraid of wooden pedestrian bridges and would always run through the water instead. She also had no fear of skunks, yet somehow never got sprayed! Moke, our first German Shepard, used to cause a raucus whenever my brother and I wrestled. In but a moment, he would grab an ankle in his teeth and pull until we separated. I became allergic to my cat as a child. We tried a poodle for a few months, but my Mom decided to give him away. My husband and I just got a new puppy for our sons. I hope to give my children the experience of having a pet that I didn’t have. We had a number of nameless cats as I was growing up. They were all simply referred to as “gadou” (Armenian for “cat”). Unfortunately they all suffered similar ignominous ends typical of working-class emigre households. The most compelling one, for me, was #2 (of 5 in total), the male Siamese-domestic mix we adopted in 1970 from my friend’s dad, who in turn adopted the kitten from sources unknown as a distraction for his inattention during his 6-week summer custody of his children. He was the sweetest, smartest cat I have ever encountered. Lasted in our lives only a year physically, but forever in my heart. He was surrendered to the SPCA (long before they were a no-kill shelter) as we prepared for a summer trip. I knew about alternatives such as boarders and petsitters, but my unenlightened parents couldn’t care less about my suggestions. To add insult to injury, when we returned, our parents drove us to the SPCA – as if they expected to conveniently find him waiting for us! Aggravated doesn’t even begin to describe my feelings. I still steam when I think about my futility in trying to save him, and James Taylor’s “You’ve Got a Friend” still reminds me of him. You can bet when I later adopted a cat of my own and then had to give him up when my lifeplans suddenly changed, I went out of my way to ensure that he would be safely re-homed! Macanudo was just 8 weeks old when we got him (a chocolate labrador). He followed us everywhere and was happiest when he could just lie next to you no matter how uncomfortable the space. One day, he discovered the food bin and attempted to eat his weight in food. He must have lied on the floor in bliss, yet uncomfortable for days. Unlike our former beagles, it took that one mistake to never do it again. Wow, a dog that quickly learns from his mistakes! Personally training him was the best experience we ever had and to this day hope to have the pleasure of doing it all over again. A little abused, starving black & white tuxedo kitten appeared in our yard one day. Because he was so tired and hungry, it was not too difficult to tempt him with a can of smelly fish cat food. While he was eating, I scooped him up and took him inside to my secure “kitty run”. While he finished eating, I combed 300 fleas from his fur! He promptly drifted off to sleep. Because of his early trauma, he was quite shy, and bonded only to me, treating me as his savior/rescuer. In time, he warmed to my husband, too, and became the dominant cat in the household. Fortunately, the other two resident felines were just fine with being subservient to him. I loved him and he loved me unconditionally for 14 years, when he succumbed to hyperthyroidism. I was devastated, and still grieve if I let myself dwell on his loss. He was a beautiful, wonderful cat.